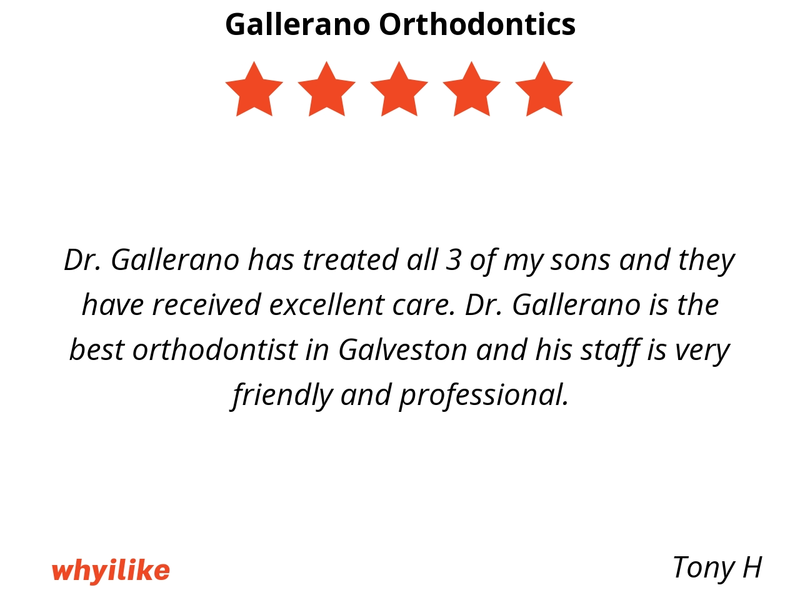 Dr. Gallerano and his team have been serving the Orthodontics needs of Santa Fe and the Texas Gulf Coast area for over 30 years. 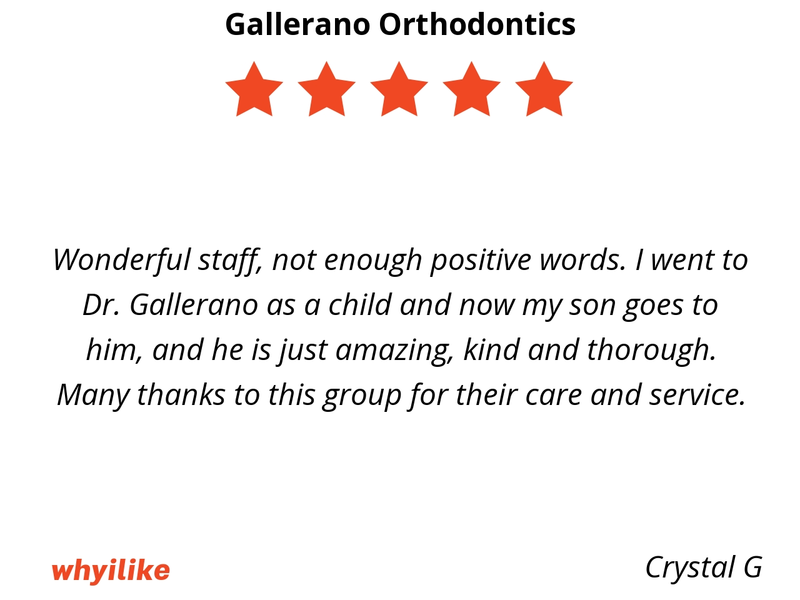 We are committed to the highest quality and make sure that your orthodontic experience is as pleasant as possible. Friendly staff; Work well to accommodate your schedule; Caring to each patient; I came as a kid and I’m bringing my family back. Wonderful staff, not enough positive words. 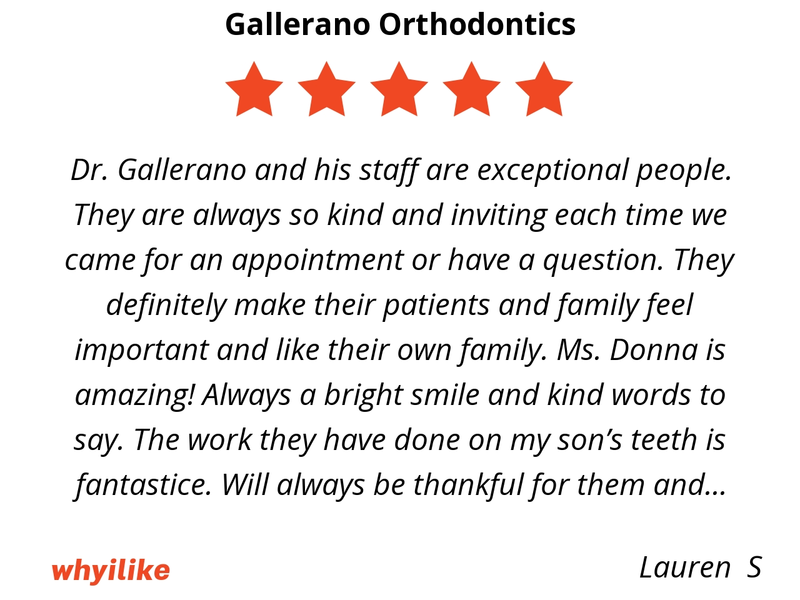 I went to Dr. Gallerano as a child and now my son goes to him, and he is just amazing, kind and thorough. Many thanks to this group for their care and service. I have had one child complete her braces and they are beautiful! Now I have 2 more kids in braces and I am very excited to see the results! 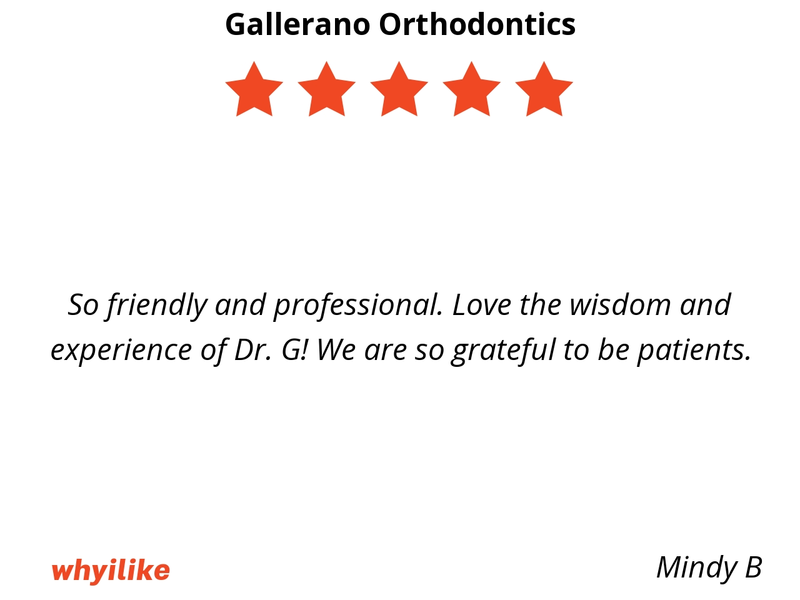 Dr. Gallerano is very thorough and precise and is conservative with his actions. The office staff are always a pleasure to talk to. His technicians are knowledgeable, kind, gentle and take really great care of my kids. We love this office!! So friendly and professional. Love the wisdom and experience of Dr. G! We are so grateful to be patients. I love that when we come in they know who we are and treat us like family. You can’t find that much anymore. 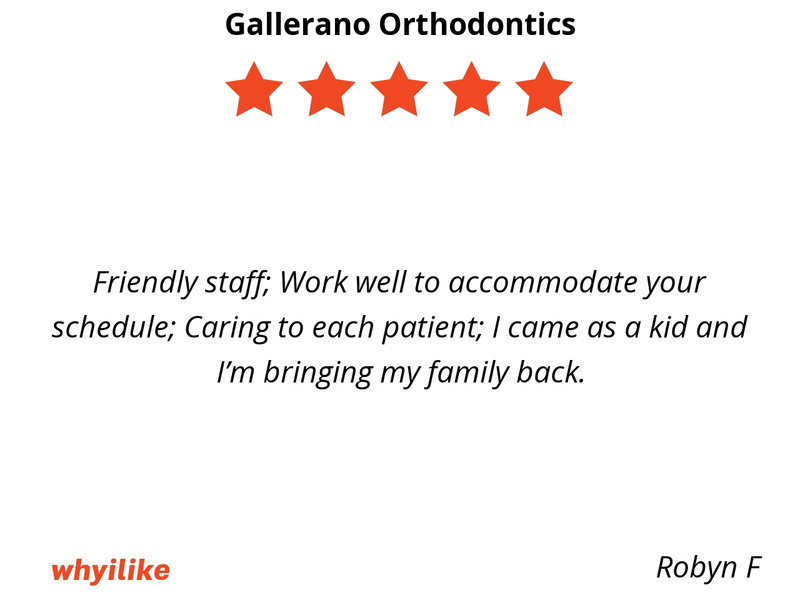 Dr. Gallerano has treated all 3 of my sons and they have received excellent care. 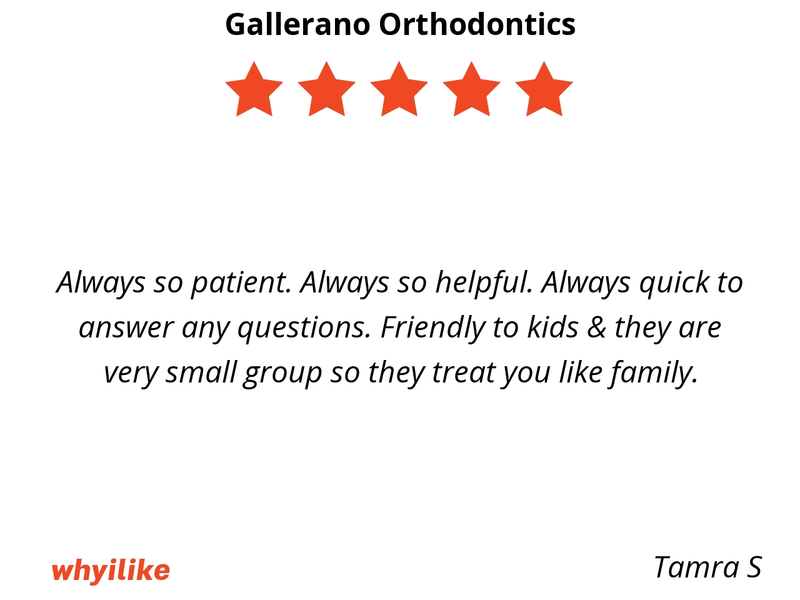 Dr. Gallerano is the best orthodontist in Galveston and his staff is very friendly and professional. Always so patient. Always so helpful. Always quick to answer any questions. Friendly to kids & they are very small group so they treat you like family. 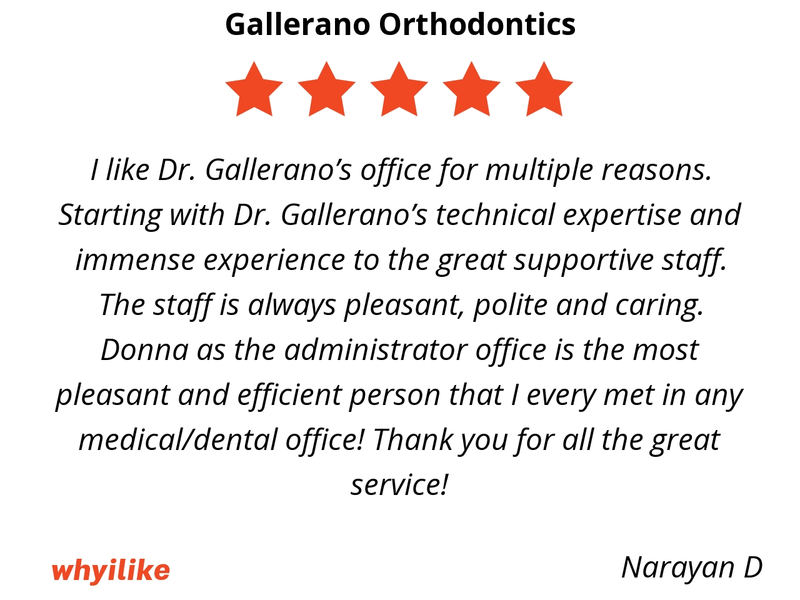 Dr. Gallerano and his staff are exceptional people. They are always so kind and inviting each time we came for an appointment or have a question. 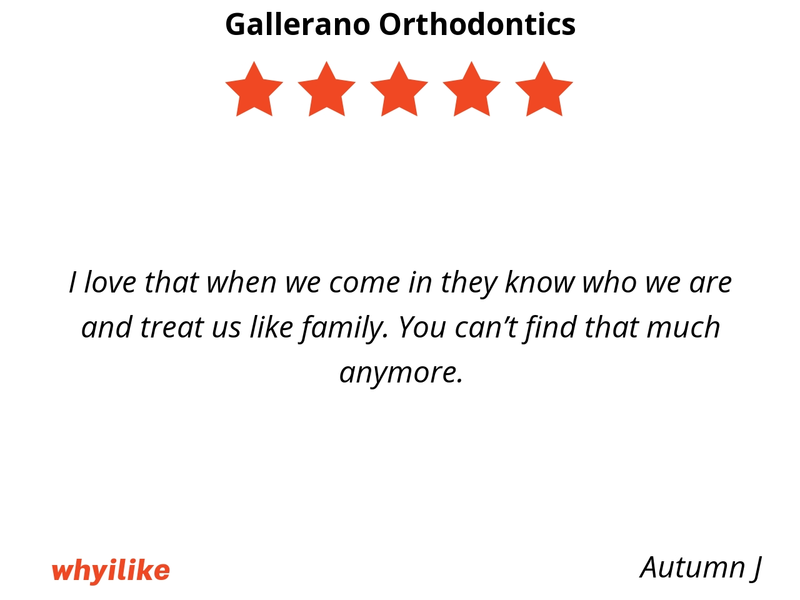 They definitely make their patients and family feel important and like their own family. Ms. Donna is amazing! Always a bright smile and kind words to say. The work they have done on my son’s teeth is fantastice. Will always be thankful for them and would recommend them to anyone. We had a wonderful experience here! The very few emergency problems were addressed right away and that made us feel relaxed and calm! Good job…her smile is totally worth it! Why do we like Dr. Gallerano? Let me count the ways…The frond staff is awesome. Ms. Donna treats you like family and always try to be accommodating when scheduling appointments. 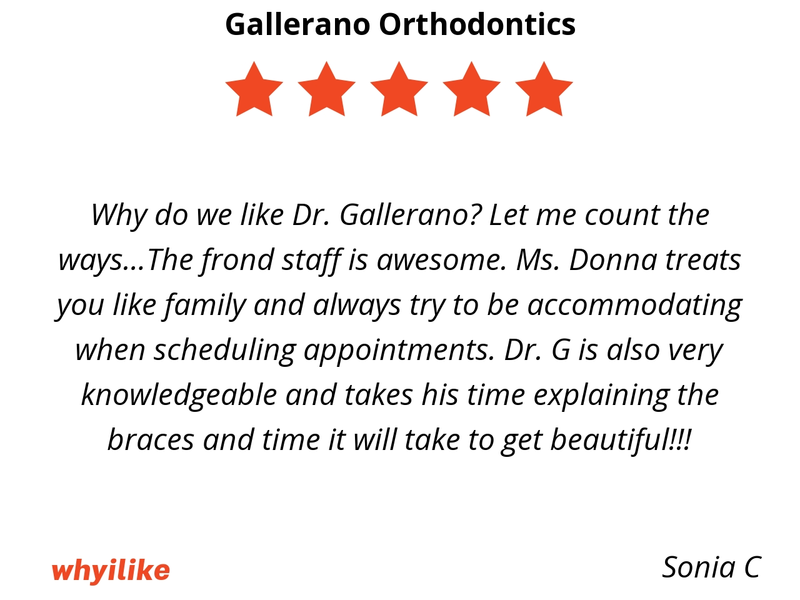 Dr. G is also very knowledgeable and takes his time explaining the braces and time it will take to get beautiful!!! I like Dr. Gallerano’s office for multiple reasons. Starting with Dr. Gallerano’s technical expertise and immense experience to the great supportive staff. The staff is always pleasant, polite and caring. Donna as the administrator office is the most pleasant and efficient person that I every met in any medical/dental office! Thank you for all the great service! 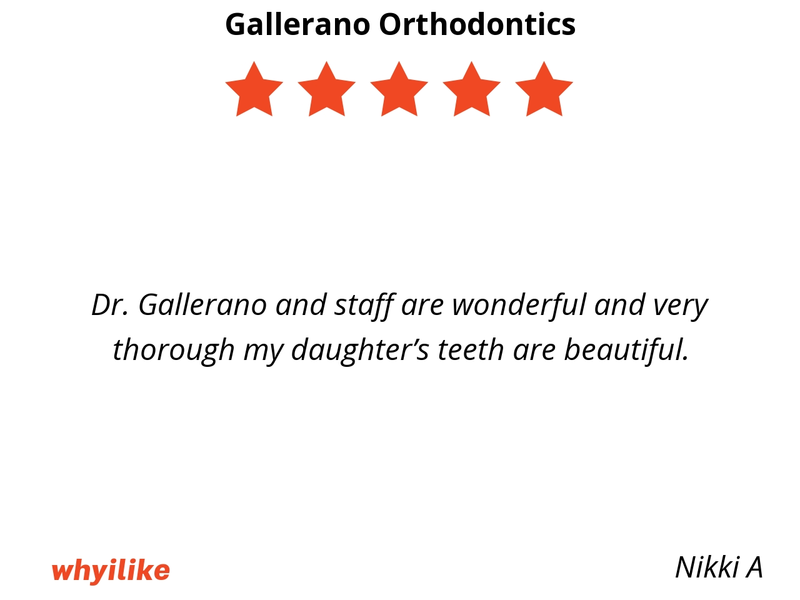 Dr. Gallerano and staff are wonderful and very thorough my daughter’s teeth are beautiful. 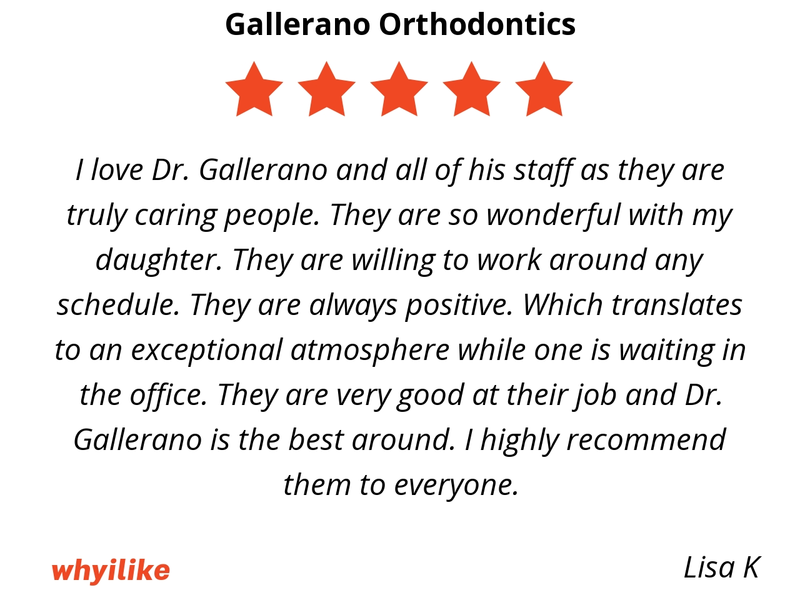 I love Dr. Gallerano and all of his staff as they are truly caring people. They are so wonderful with my daughter. They are willing to work around any schedule. They are always positive. Which translates to an exceptional atmosphere while one is waiting in the office. 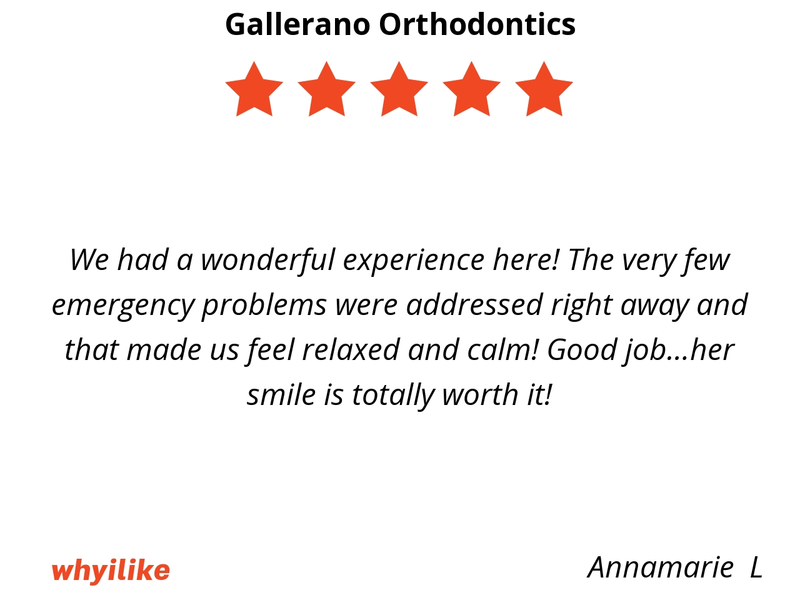 They are very good at their job and Dr. Gallerano is the best around. I highly recommend them to everyone.